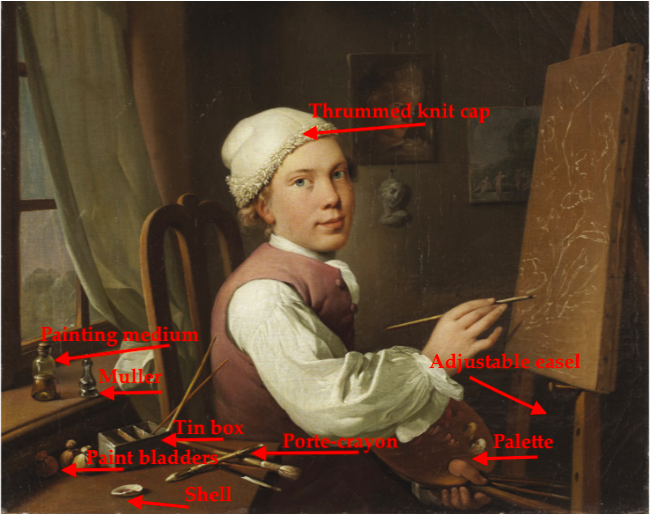 Jens Juel, Self portrait at an easel. Oil on canvas, 1766. Royal Academy of Fine Arts, Denmark. 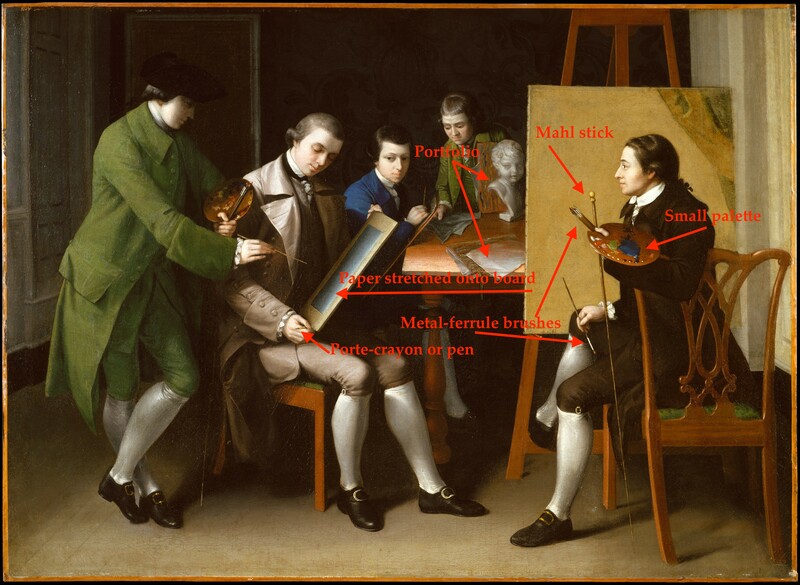 Once again, I’m looking into artists’ materials and techniques, though instead of trying to kit myself out for the early Federal era, I’m digging into the last half (quarter) of the 18th century. It seems to be a time of rapid transitions in art materials as new pigments and media are developed. While Mr. Juel is beginning a work in oils, we still see some of the same tools that a watercolorist would use. Brushes, though his are shaped for working in oil; a shell, perhaps to combine pigment with medium, and bags of paint. In Pratt’s American School, we can see how small the palettes are, and how small the dots of paint are compared to the pools where colors have been mixed. The easel, presented from another angle, offers clues to the adjustable pegs and triangular/tripod shape of the main support. But what of watercolors? Winsor & Newton Old Paints: note the tiny bags of paint. To date, I’ve found conservation reports more helpful than anything else, especially those analyzing paint content for sugars and gums. (One of the keys to watercolors was the re-wettable aspect of the colors; gum arabic, gum tragacanth and honey or sugar were ingredients used in varying proportions to achieve what we now take for granted.) The first watercolor cakes or blocks are introduced in 1780 by William Reeves; often, these were very hard, and had to be agitated in water (ground on a surface) to be used, much like sumi-e ink. Once paint was ground with water, it could be dried in a dish or container for re-wetting and later use. The question of course is, what do dry it in? How do you mix and use the paint? Mixing is simpler to solve: a palette, of course. 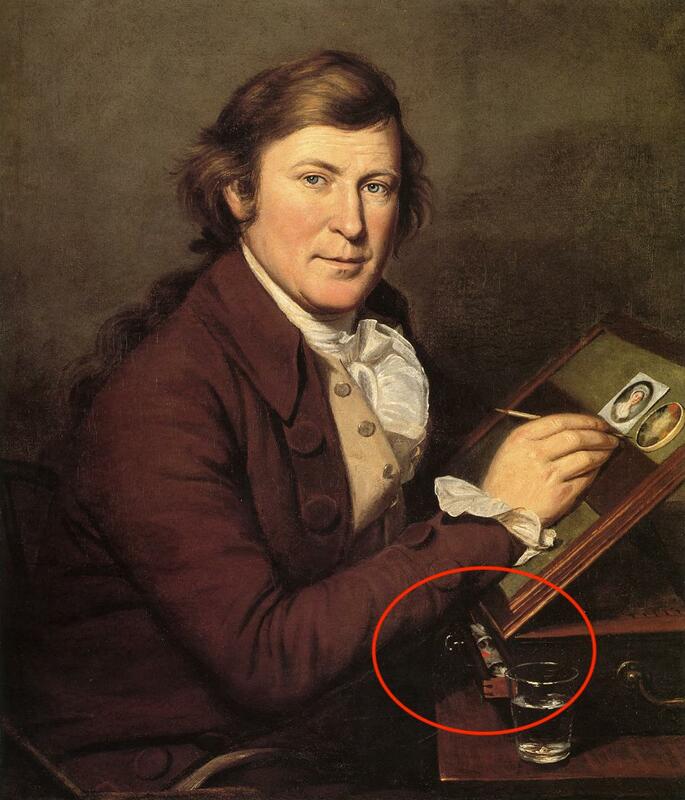 The small, dirty-looking oval in the image above is the ivory palette used by Caroline Schetky Richardson; while her box is 1820-1830, it’s still very similar to box in Charles Willson Peale’s portrait of his brother James (below). The box is 21 inches wide, 10 inches high, and 13 inches deep. That makes the palette something like 3 inches wide, if we take a drawer as five inches wide. In the CWP portrait of JP, the slightly open drawer of the painting stand may be giving us a peek at his palette; the simple tumbler of water helps confirm that he is working in watercolor on ivory, and give us a sense of what kind of water container artists used– which, happily, can be more easily sourced than Mr Peale’s box. Some objects you can’t shake. So you buy them. When I was little, one of the games my mother and I played was “I packed my grandfather’s trunk.” You start with that line, and take turns adding an item in alphabetical order. The trick is, you have to repeat the whole string as you go along, so that by the time you’re packing a zebra, a zither, or zwieback, you’ve got to remember the other 25 things you and your companions have packed. It’s a good game for waiting rooms when you can’t run around, and fun for people who love words. How many nouns that start with “y” can you think of? After lining the bottom with paper, I packed the linens. In less than a week, I’ll be packing someone else’s greatx-grandfather’s trunk for a trip westward into the (relative) wilds of New York State to join a Sketching Party. Despite two intense weeks, I’ve persevered on the orange check gown and made significant progress on the Thriller Spencer and finished the second sheet. This is a trip to a different class altogether, one of my two annual forays into the mercantile class of the early Federal period. It’s quite the thing, packing your alter ego’s equipage for another century, and as I’ve enjoyed a longer commute recently, I’ve pondered the ways in which we stereotype certain kinds of living history practitioners. Progressives don’t always travel light: they travel right, and in this case, it means a quantity of baggage to create the proper simulacrum of an 1814 excursion. It’s a quantity of stuff, isn’t it? While I decry the use of film and television as sources for historical costuming, I do appreciate them for inspiration, and it is remarkably easy to get someone else hooked on a good adaptation like the BBC’s 2009 Emma. The depiction of the picnic on Box Hill is particularly good (i.e. excruciating) and the pile of materials required for appropriate comfort is overwhelming to anyone who prefers to travel lightly. Never before have I considered a turkey carpet a possible accessory to an excursion, but when one intends to ape one’s betters and bring culture to the frontier, anything is possible. In a mere four weeks, I will pack the Subaru and head west into New York State as so many Rhode Islanders have before me. And while I will have clothes suitable for the time of the RI Quaker Migration, I will be leaving not to found a more utopian society nor to seek my fortune on a farm. Instead, I’ll be joining some dear friends for a weekend sketching party (minus the horse and carriage). This new enterprise has required some additional research, and while I look forward to painting miniatures at some point this summer, I suspect this venture will be a simpler proposition. A new dress and apron are the least of my worries: brushes, watercolor boxes, sketchbooks, pencils and pens all require research just when I should be thinking more seriously about the way the Revolution played out as a civil war in New Jersey. Still, the Yale Center for British Art has rarely failed me: a simple search for sketchbook turned up a catalog record for three sketchbooks of 82 drawings by Anne Rushout. These are lovely, well-executed landscapes in a fine British tradition, far more sophisticated than Diana Sperling or Sophie DuPont– I fear I will closer to Sperling and DuPont when I take up sketching again, and can at least console myself that my wonky drawings will be part of a fine tradition of ladies’ accomplishments. The Yale Center for British Art also has a nice Romney sketchbook for Paradise Lost, which demonstrates the cartoon-like nature of preliminary drawings (and I mean cartoon in the old sense, not the Animaniacs sense, though the uses are related). And as I sew my dress of unmatched checks, I have art programming to entertain me: Fake or Fortune, thanks to a tip from Ms B, has provided happy, envious hours of conservation labs, artists’ colourmen, and auction rooms. Vicarious delight, indeed.